An x-ray or radiograph is similar to having a photograph taken in a portrait studio. Our Doctors uses non-visible x-rays (shorter wavelength) to expose film similar to a photographer using visible light to expose film. The exposed radiographic film demonstrates the body structures. X-rays, demonstrate body structures proportionally with their density. The denser the tissue, (bone versus fat) less x-ray reaches the film. This difference in body tissue density is why bone (high body tissue density) is white on a radiograph, as compared to fat (low body tissue density) which is gray or air (no density) which is black. Radiographs are a reliable and accurate means of obtaining information to help your physician diagnosis the cause of your pain. An x-rays examination is commonly used to determine the presence or absence of disease, a bony fracture, joint mis-alignment, arthritis, or source of other painful conditions. 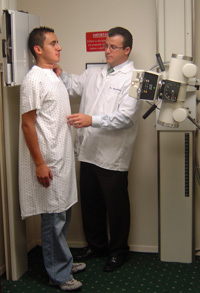 For a routine x-ray examination, no preparation is required. If you are pregnant or think you may be pregnant, be sure to inform your physician, prior to the start of the x-ray examination. Most examinations using x-ray will not be performed on pregnant women unless the benefits of the examination outweigh the risks of radiation exposure to the fetus. X-ray uses ionizing radiation. Our Doctors are experts in utilizing the minimal dose to achieve optimal results. Lead aprons and shields are used, and the equipment is routinely inspected by the State of New York, for safety and adequate shielding. All examinations are well within permissible levels of diagnostic radiation dosage. Weight bearing X-rays are performed and read on premise. The MRI shows the spine in very clear detail, including information about the bones, ligaments, muscles, nerves and discs. It can show if there is a loss of water in the nucleus pulposus, which occurs in the earliest stage of disc degeneration. 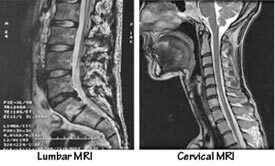 An MRI can be used to show facet joint arthritis, spinal stenosis (narrowing of the spinal canal), or a herniated disc (protrusion or rupture of the intervertebral disc). The test is useful for diagnosing any condition in which the anatomy of the spine and its soft tissues need to be seen clearly. Dr. Abrankian explains the results from a MRI. 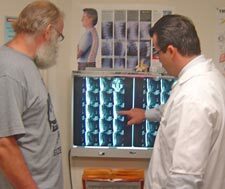 All MRI’s are pre-certed by our insurance department and Abrankian Back & Neck Center has a personal relationship with the top open and closed MRI facilities in the area allowing patients to be seen immediately and reports generated within 24 hours.